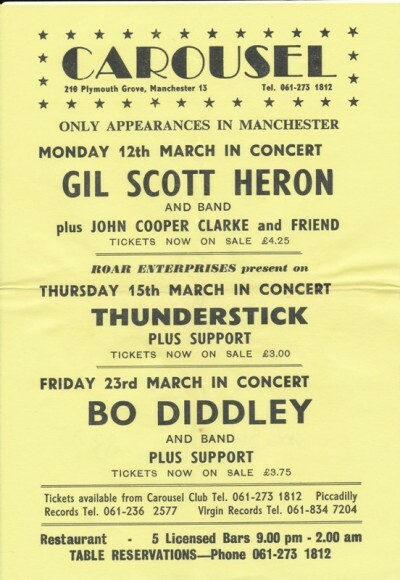 I Saw Gil Scott Heron a few times but I think this was the first time.I walked from Hulme to The Carousel because like most people then in Thatcher's Britain (had to get that in!) I was mostly skint.I remember it was freezing, with snow on the ground but when I got there it was packed and therefore boiling and almost worth the walk just for that.I don't recall having been in that club since it was an Irish club and I had to go for family do.s (never did get into the Irish Showband thing.Great names though;Bernard and the Snowdrops,Big Tom and the Mainliners (! )...etc).Well old Gill was in top form and the best I ever saw him.He just talked for probably an hour or so and then the band started playing;it was good.I believe after his lost years he's started making music again.Can't remember who J.C.C.s "friend" was....just had a flashback of him and Wreckless Eric doing "Mad Dogs and Englishmen" for an encore one time...class act.I saw Bo Diddley at the University Union once and even got his autograph on the back of my "Saver Seven". !Thanks Bo.